I just love going home for Christmas each year to be around all of my family and friends that I hold so dear in my heart, but also to see the very special way that my mother displays all of her Christmas ornaments and decorations around the house each year. Ever since I was a child, I thrilled at watching how the house would literally become transformed into a wonderful little winter wonderland. Each Christmas ornament and decoration would be placed ever so lovingly in its place by my mother and to this day I can not wait to come home to look at and admire every little detail that made our house an extra special home each Christmas. In our home, each special Christmas ornament and decoration had a very specific place that it belonged. We did not just decorate it all at once either. It became a week long event that would fill each of us kids with anticipation as we waited for each piece to be placed in its rightful home. First, we always started with the outdoor Christmas decorations. Dad would struggle with putting up the Christmas lights and always managed to hit his thumb with the hammer as he tried to get the lights up just the way mom liked them. Large round wreaths with big bright red bows would hang from each window and a very special wreath would hang on the front door greeting all of our family, friends, and neighbors who would come by with gifts and goodies throughout the holiday season. My mother would attach some of her favorite Christmas ornaments to the wreath on the door in hopes of putting a smile on the face of everyone who came to visit. The first thing to get decorated each year inside the home was always the fireplace. Mom always said it needed to be decorated first because it symbolized the warmth we felt in our hearts for each other and that needed to be expressed with an extra special display. 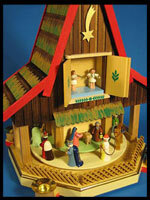 I always loved setting up the nativity scene on the mantle with our collection of tiny wooden figurines because it was like I was creating a little town and I always imagined that at night when we were all asleep the figurines would come to life and move about the tiny town we had created for them. It was so much fun to set up the miniature trees, little houses, and tiny carolers all surrounded by a thin layer of cotton ball snow. Mom would then hang the stockings and she always hung a dozen or so shiny star ornaments around the stockings with ribbon to give it a little extra sparkle when the fire was lit. The staircase was always the next to get the royal treatment. My mother would put a big red poinsettia plant on each step, then wrapped fresh garland around the top of the staircase handle, and finally hung little angel shaped Christmas ornaments from the wreaths in between each spindle. This always made the house smell like Christmas. We just happened to have twelve spaces between each spindle that made its way up the staircase to the second floor, so mom would hang a different angel ornament in each space and told us how they each represented the twelve days of Christmas. This always inspired us to sing the Twelve Days of Christmas as we decorated that staircase each year. Finally, the day would come that we would all go out and get the Christmas tree. This was always a special day for me as a child because it was so much fun being with the family and finding the one tree that was meant for us. Once we chose a tree and brought it home, dad would always struggle with cutting the trunk just right so the tree would stand up perfectly straight. Every Christmas we would always manage to come home with a tree that was too big and dad would painstakingly trim off branches to make it fit. When it was ready, we would first wrap the Christmas lights around the tree, followed by hanging the tinsel. The kids would always want to just throw the tinsel on the tree in giant handfuls, but mom always insisted that the tree would not look right unless each piece of tinsel was placed on the tree individually. Even though we would all complain, she was right and the tree always looked as if it had sparkling icicles hanging from its branches. Then it was time to break out the truly special Christmas ornaments that were always set aside to be placed only on the Christmas tree. There were tiny wooden snowmen, little sparkling snowflakes, majestic looking nutcrackers, more little angels, and my favorite Christmas ornaments of all, the delicate hand-painted glass ones that always seemed so fragile that I was afraid I would drop one and break it. Each ornament would be hung just right and it always seemed as if there was a specific branch just made for each ornament to fit perfectly. While I would see other the trees of other people decorated with those store bought round balls of red and green and gold, I always appreciated the care and tenderness my mother would put in to placing each special ornament onto the tree. She would always tell us how she had collected each Christmas ornament over the years since she was a child and that each one was precious to her because it represented something special in her life. She would show us the ones her own mother bought her when she was a child, the ones dad had bought her when each of us kids were born, and the ones that had been handed down to her from the collection of her own grandmother. I always felt a great sense of pride each time I looked at the history that was represented in our Christmas ornament display as they hung from the tree each year. Now, each time I return home with my own children, I love to watch them helping their grandmother with decorating the tree and listen as she shares with them the stories that I have held in my heart since I was a child at Christmas. While I enjoyed hanging the ornaments and decorations around the house when I was a child because it was fun and they were pretty, I now realize that ornaments do not just hang on trees, they hang in our hearts as well.